CLICK ON ABOVE FOR full size view. 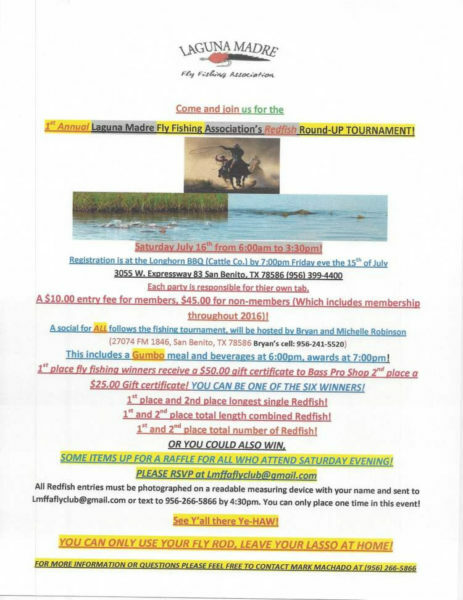 Join us this coming Tuesday, June 14, 2016 at Bass Pro Shop’s (Harlingen, TX) meeting room near the bowling alley to tie different varieties of the clouser minnow. This is a simple fly that has been tied using a variety of materials. Its also caught fish all over the world from tarpon to panfish. We should be able to tie at least four different varieties, so if you are just starting fly tying this session will give you the experience you need to catch all types of fish. We’ll start the session about 6:30 p.m. See you there.